“Exhale” and “Solitude” are the titles of two related video works by the Swedish/Swiss artist Jessica Faiss. 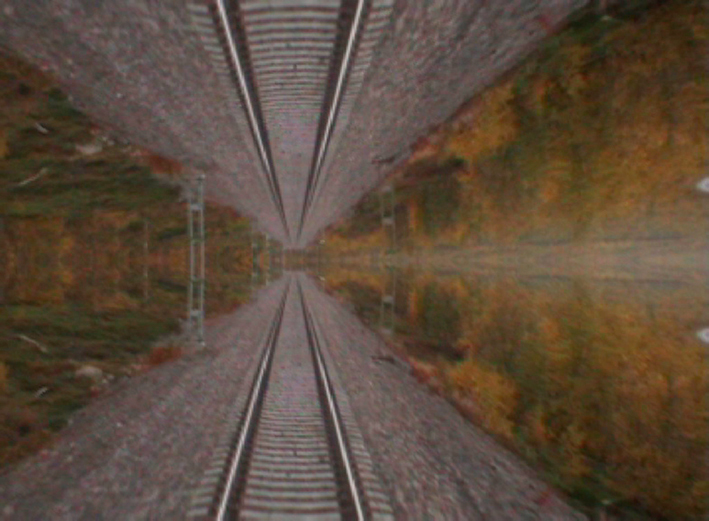 In both videos the beholder follows a suggestive movement forward from the inside of a car or a train, experiencing greyish or autumnal sceneries passing by. The videos are based on motion and suggestive moments in unpopulated areas in a Nordic environment and describe a state of travelling in a continuous, meditative movement, which is a recurrent theme in Jessica Faiss´ works. The artist describes it as a way to capture a sense of vulnerability and loneliness but also of peace and liberation. It’s about to face oneself in an existential condition in which suggestive and repetitive movements through landscapes creates conditions for such a meeting to take place. Although Jessica Faiss is an artist that works in several different techniques the imagery is held together by a visual purity and reduction. Thus emerges a natural dialogue between the different expressions – video, photography, collage and painting – which highlights different perspectives on a ground state. The images in the videos are alternately seductive and disturbing that attract and hold the viewer’s gaze and perception. It is a visual language that refers more to painterly qualities than to narrative and narration.